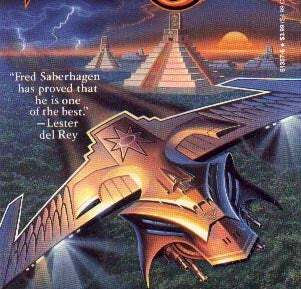 If you're starved for alternate-universe stories (or just wish there were more stories about Incas trying to erase the Conquistadors from history) then a new anthology based on a Fred Saberhagen novel is for you. According to Publisher's Marketplace, Golden Reflections will be an anthology of stories based on Saberhagen's novel Mask Of The Sun. It'll be edited by Joan Saberhagen and Robert Vardeman, and will include seven "distinguised SF writers." And Baen Books just agreed to publish the result. In Mask Of The Sun, Mike Gabrieli's ne'er-do-well brother Tom disappears, soon after discovering a super-valuable Aztec relic, a golden mask. Mike decides to try wearing the mask, and finds himself traveling between the past and the future, and even to alternate realities. He becomes "the focal point of an inconceivable war between time-traveling Tenokas and 16th century Incas." One of the characters in this story says ". . . don't worry if you don't understand it all. Like trying to make common sense out of the theory of relativity." Truer words were never spoken. I don't know about you, but I'm ready to see seven distinguished SF authors tackle time-traveling Inca masks and alternate timelines where the Incas never fell. Especially if they can rope Sesshu Foster into contributing.